A healthy shining smile is something we all aspire to have. In my younger days I definitely could have taken better care of my teeth. Looking back at old photos and seeing my then yellowish teeth I ask myself "how did I let my teeth get like that?" Well, now I care more about my smile more than ever! I drink a lot of coffee and tea (especially Thai Tea which happens to turn the entire mouth orange), and well... we all know how bad that can be for the color of your teeth. I knew that I wanted to have a brighter smile getting older. 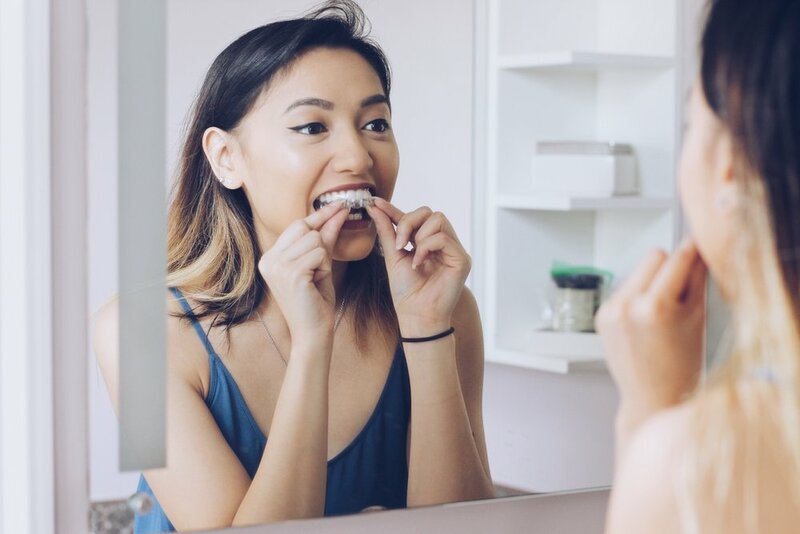 For many years I have tried out quite a few teeth whitening products (crest whitening strips and kits with LED whitening), but the most positive experience I've had was with Smile Brilliant. I’ve had the exciting opportunity to whiten my smile with SmileBrilliant’s Teeth Whitening Kit. This was a process that was easy, user friendly, and has great value. Like any teeth whitening product, it required consistency and time, but you can trust me when I say this one is very well worth it. I was skeptical about these types of kits and treatments because I wasn't sure of what to expect, but this is why I believe it is extremely important to understand the brand and the process in which you are interested in before actually whitening your teeth at home. So, I’m here to share with you my experience using SmileBrilliant's affordable home teeth whitening kit! The kit came with 6 (3 white and 3 blue) pastes, 2 blue trays to mold with, 3 whitening gels, and 4 de-sensitizing gels. To begin the process, you'll use the pastes provided to create impressions of your teeth. This is for the lab technicians at SmileBrilliant to make custom-fitted teeth whitening trays to fit your teeth for a better experience. Mix the white with the blue until it is a sky-blue color, but this process has to be completed within seconds or else the mold will harden and the impressions won't be as great. I messed up the first time because apparently I was too slow, but that's why there's a third paste! After I successfully created my impressions and shipped them out, it took me about a week to get my trays back. I thought this was wonderful because I didn’t have to worry about creating my own trays that 1. were uncomfortable and 2. lose its shape after a few uses. The trays are quality teeth whitening trays and I'd love to have forever. Once you get your custom-fitted trays, brush your teeth without toothpaste and start whitening! The duration of each session can vary between 30 minutes to 3 hours, depending on your teeth and gum sensitivity. All you really need is a nice line of the whitening gel between the tray to let it work its magic, and you'll only need to use about 1/3-1/4 of a syringe for each session. My first session was about 30 minutes and I've used the whitening gel for 10-12 sessions over the span of 3 weeks - it could have been shorter if I wasn't so tired from work coming home, but that's alright because I'm happy with my results. Due to my gum sensitivity, I couldn't handle it at first. It had been awhile since I've used any teeth whitening products and my gums could not last longer than 30 minutes. But fear not, because SmileBrilliant sets you up for success with the next step! These are a life saver, seriously! I really liked how SmileBrilliant provided de-sensitizing gels just in case I needed it because boy were my teeth sensitive. With the de-sensitizing gels, you'll want to keep this on for as long as you can to diminish the sensitivity. By the end, I've realized I only used 2 of these syringes until I didn't feel the need to after a handful of sessions. Here is my result! The before photo was taken in the bathroom at night with the lights on. The after photo was also taken in the bathroom, but in the mid-afternoon with natural lighting. Neither were taken with flash. After each session I saw a difference in the coloration of my teeth that I was super excited about! Smile Brilliant is offering you, my beloved reader, the chance to win a Smile Brilliant kit of your own (valued at $139)! Be sure to enter your correct name and email address! To enter the giveaway, click the button below! The winner will be chosen 2 weeks from the date of this post and will be contacted via the email they provide.